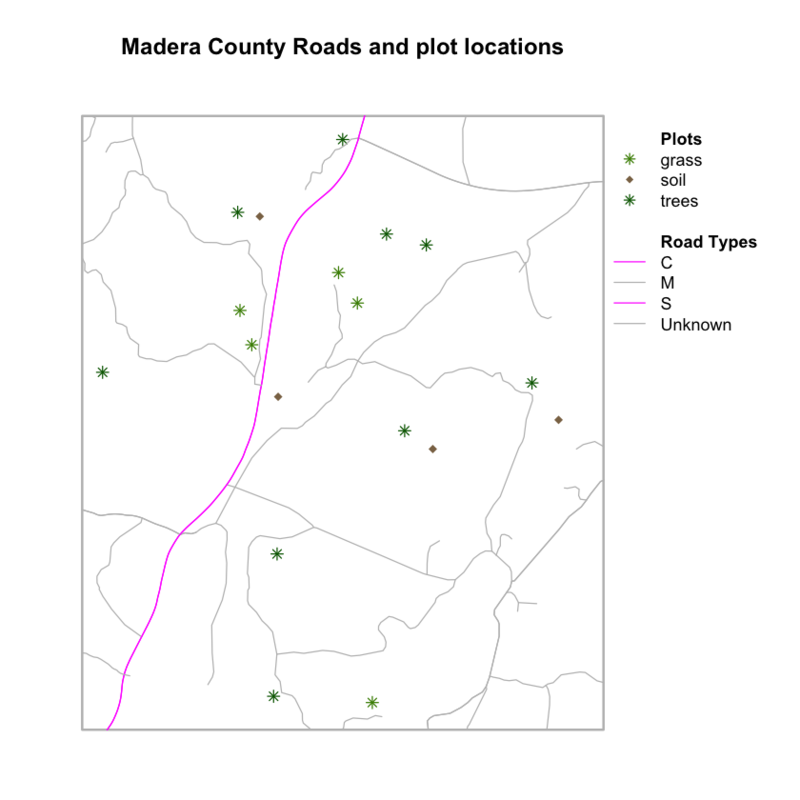 Welcome to the first lesson in the Create Maps and Custom Legends in R with ggplot and Base Plot module. 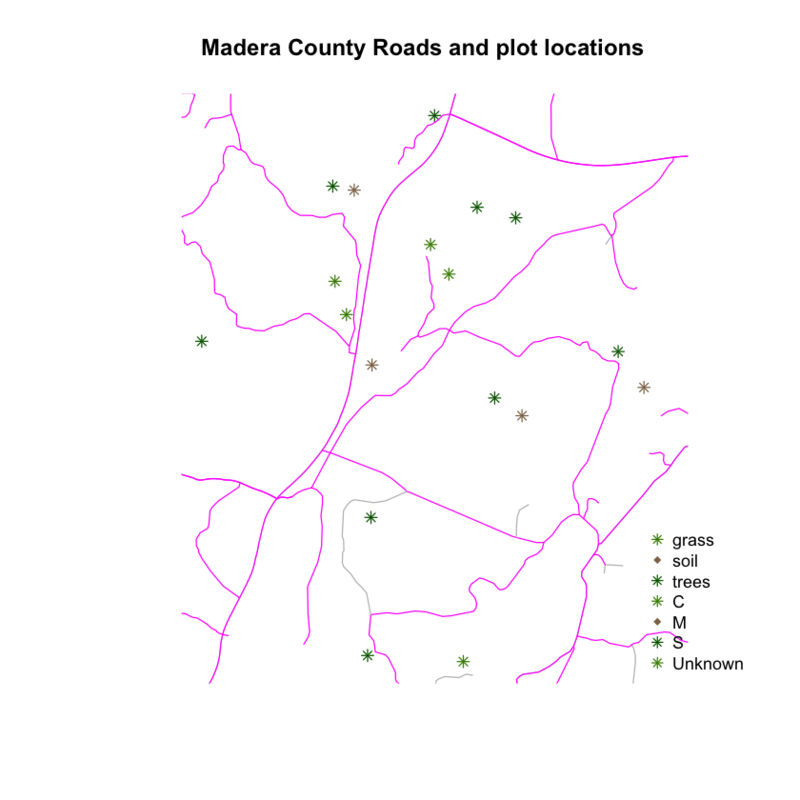 Learn how to create maps with custom colors and legends in both base R and with ggplot in R.
Add a custom legend to a map in R.
Plot a vector dataset by attributes in R.
you can group vector objects by a particular category value - for example you can group all lines of TYPE=footpath. However, in R, a factor can also have a determined order. 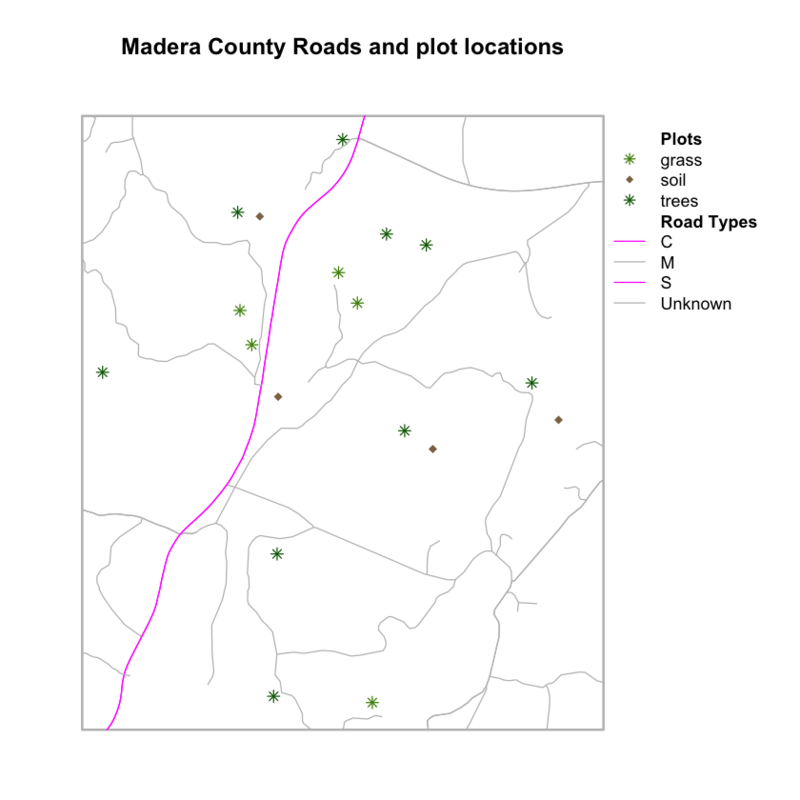 By default, R will import spatial object attributes as factors. 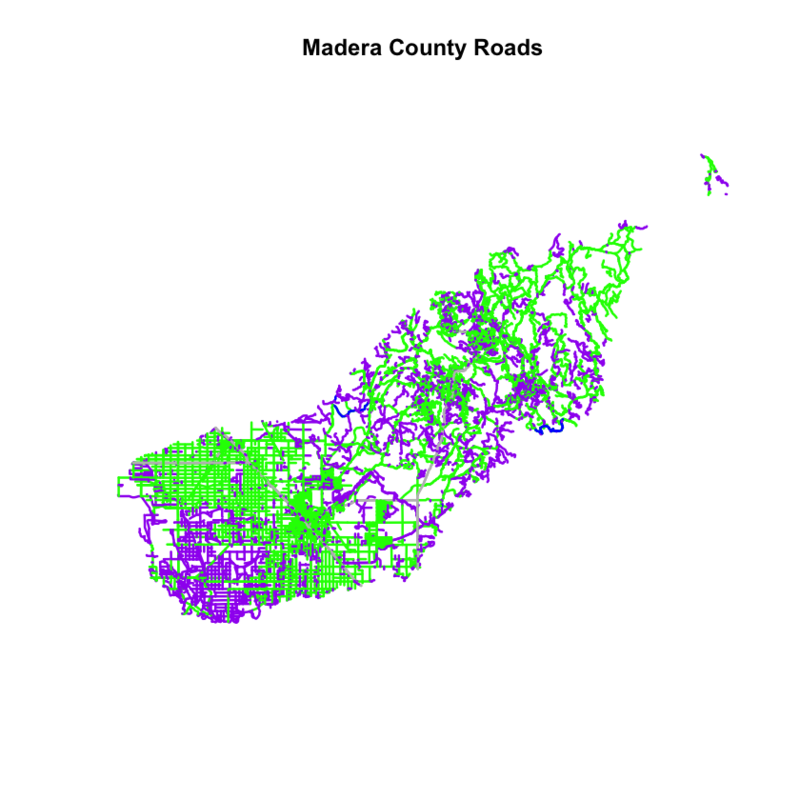 ## Source: "data/week-04/california/madera-county-roads/tl_2013_06039_roads.shp", layer: "tl_2013_06039_roads"
Following, you can convert the road attribute to a factor. 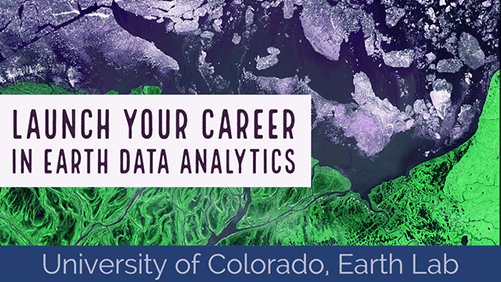 # view levels or categories - note that there are no categories yet in your data! # the attributes are just read as a list of character elements. # Only do this IF the data do not import as a factor! ##  "C"       "M"       "S"       "Unknown"
# how many features are in each category or level? When you use plot(), you can specify the colors to use for each attribute using the col = element. To ensure that R renders each feature by it’s associated factor / attribute value, you need to create a vector or colors - one for each feature, according to its associated attribute value / factor value. A vector of colors - one for each factor value (unique attribute value). ##  "blue"   "green"  "grey"   "purple"
##  "green" "green" "green" "green" "green" "green"
You can also adjust the width of your plot lines using lwd. You can set all lines to be thicker or thinner using lwd=. If you want a unique line width for each factor level or attribute category in your spatial object, you can use the same syntax that you used for colors, above. Note that this requires the attribute to be of class factor. Let’s give it a try. # in this case, boardwalk (the first level) is the widest. 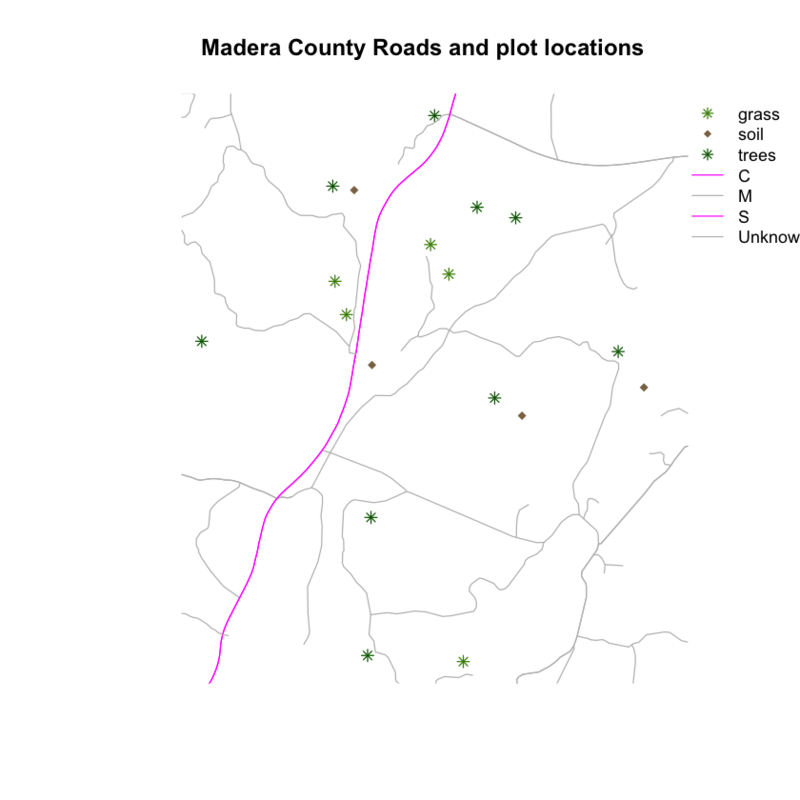 location: you can specify an x and Y location of the plot Or generally specify the location e.g. ‘bottomright’ keyword. You could also use top, topright, etc. levels(objectName$attributeName): Label the legend elements using the categories of levels in an attribute (e.g., levels(sjer_roads$RTTYP) means use the levels C, S, footpath, etc). fill = : apply unique colors to the boxes in your legend. 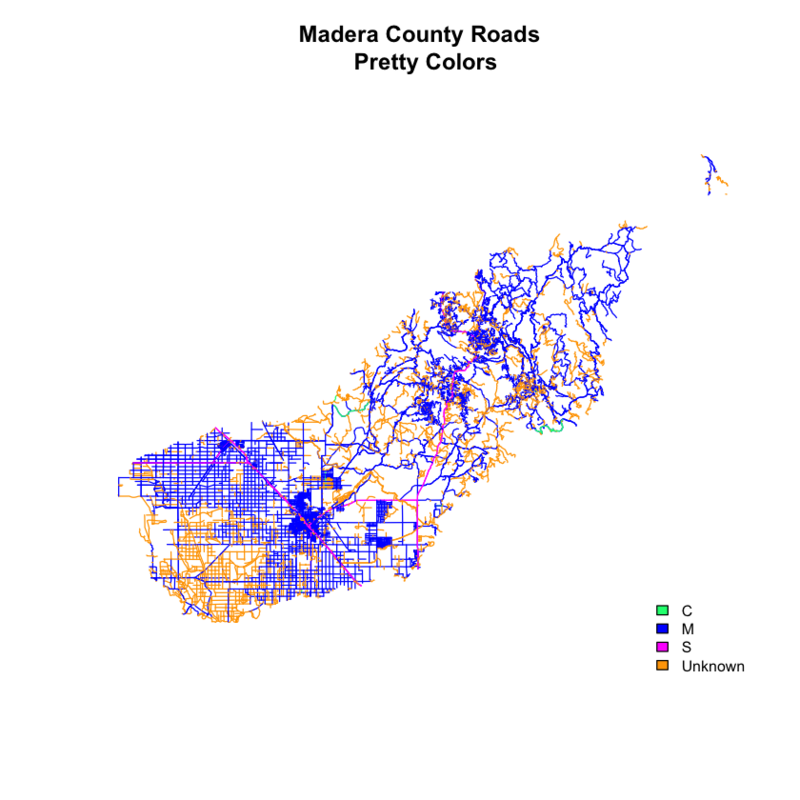 palette() is the default set of colors that R applies to all plots. Let’s add a legend to your plot. fill = road_palette) # color palette to use to fill objects in legend. You can tweak the appearance of your legend too. You can modify the colors used to plot your lines by creating a new color vector, directly in the plot code too rather than creating a separate object. # manually set the colors for the plot! ##  "springgreen" "blue"        "magenta"     "orange"
Data tip: You can modify the defaul R color palette using the palette method. For example palette(rainbow(6)) or palette(terrain.colors(6)). You can reset the palette colors using palette("default")! 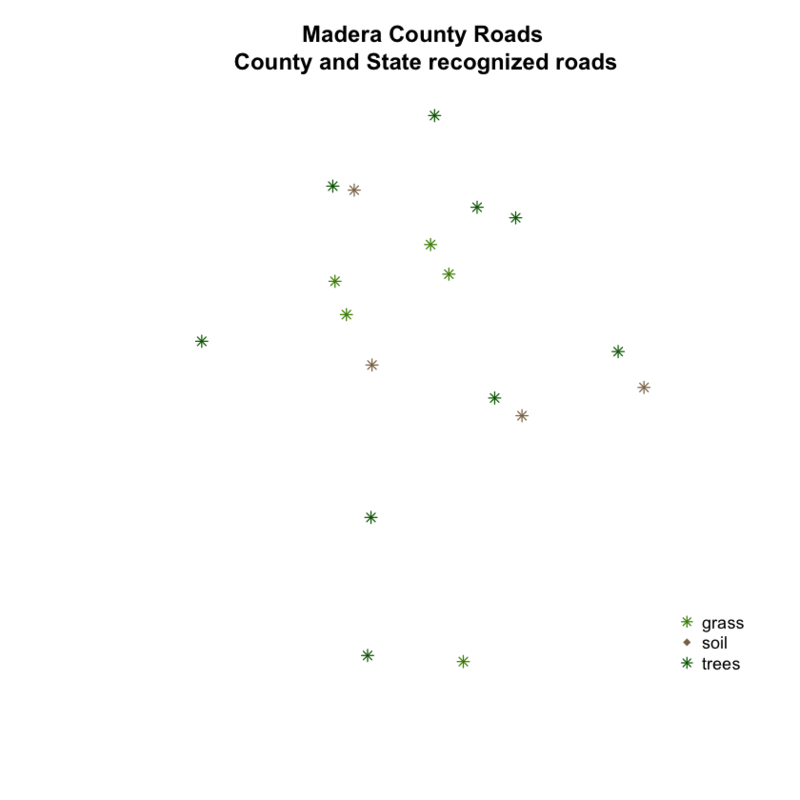 Create a plot that emphasizes only roads designated as C or S (County or State). 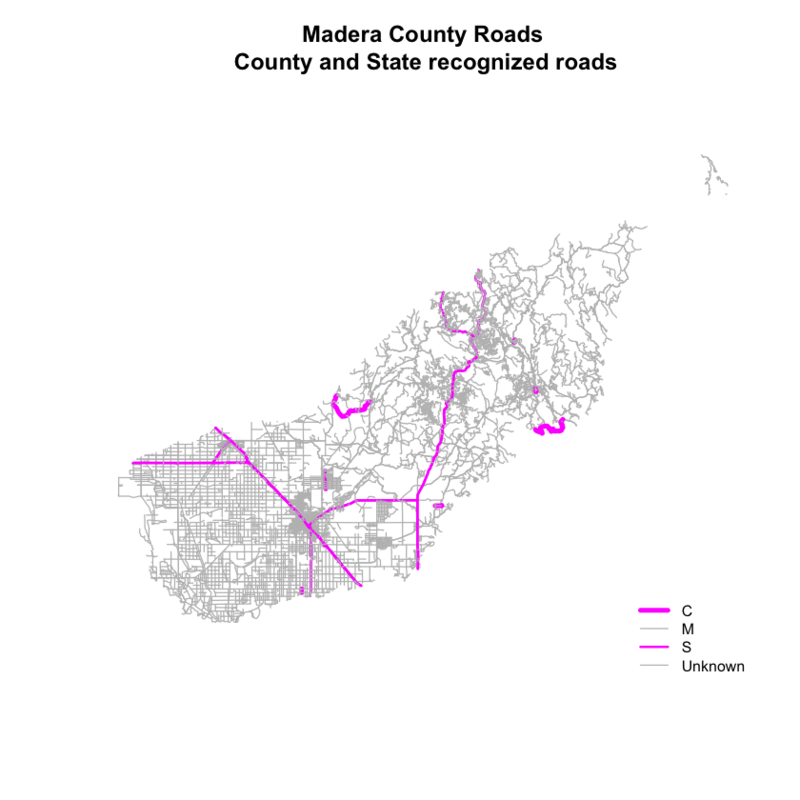 To emphasize these types of roads, make the lines that are C or S, THICKER than the other lines. 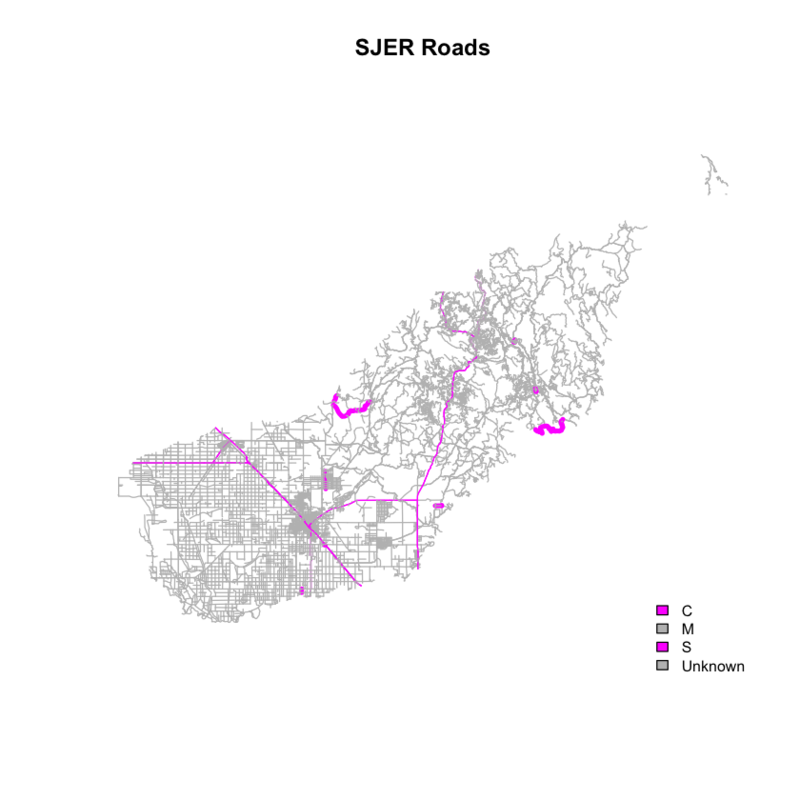 NOTE: this attribute information is located in the sjer_roads$RTTYP attribute. # make sure the attribute is of class "factor"
##  "magenta" "grey"    "magenta" "grey"
Finall, let’s adjust the legend. You want the legend SYMBOLS to represent the actual symbology in the map - which contains lines, not polygons. lty = c(1, 1, 1, 1), # tell are which objects to be drawn as a line in the legend. The last step in customizing a legend is adding different types of symbols to the plot. In the example above, you just added lines. But what if you wanted to add some POINTS too? You will do that next. In the data below, you’ve create a custom legend where each symbol type and color is defined using a vector. You have 3 levels: grass, soil and trees. Thus you need to define 3 symbols and 3 colors for your legend and your plot. Next, let’s try to plot your roads on top of the plot locations. Then let’s create a custom legend that contains both lines and points. NOTE: In this example I’ve fixed the projection for the roads layer and cropped it! You will have to do the same before this code will work. When you create a legend, you will have to add the labels for both the points layer and the lines layer. ##  "grass"   "soil"    "trees"   "C"       "M"       "S"       "Unknown"
Refining the look of your plots takes a bit of patience in R, but it can be done! Play with the code below to see if you can make your legend plot NEXT TO rather than on top of your plot. Place your legend on the OUTSIDE of the plot extent by grabbing the xmax and ymax values from one of the objects that you are plotting’s extent(). This allows you to be precise in your legend placement. OPTIONAL: adjust the plot PARameters using par(). You can set the margin of your plot using mar =. This provides extra space on the right (if you’d like your legend to plot on the right) for your legend and avoids things being “chopped off”. Provide the mar = argument in the format: c(bottom, left, top, right). The code below is telling R to add 7 units of padding on the RIGHT hand side of your plot. The default units are INCHES. IMPORTANT: Be cautious with margins. Sometimes they can cause problems when you knit - particularly if they are too large. Let’s give this a try. First, you grab the northwest corner location x and y. You will use this to place your legend. Let’s use the margin parameter to clean things up. Also notice I’m using the AOI extent layer to create a “box” around my plot. Now things are starting to look much cleaner! 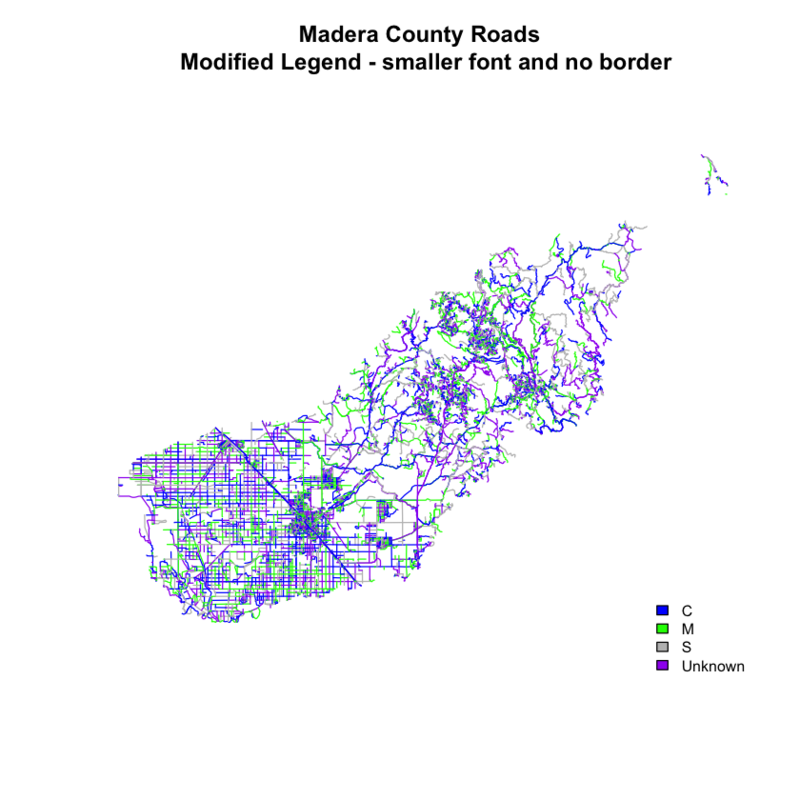 I’ve also added some “fake” legend elements to create subheadings like you might add to a map legend in QGIS or ArcGIS. Let’s take customization a step further. You can adjust the font styles in the legend too to make it look even prettier. To do this, you use the text.font argument. Notice below, I am passing a vector of values, one value to represent each element in the legend. Now, if you want to move the legend out a bit further, what would you do? Any idea how I added a space to the legend below to create “sections”? # otherwise margins will carry over to your next plot and cause problems!